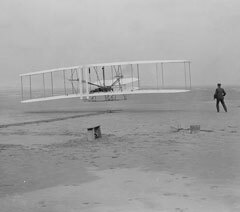 On December 17, 1903, Wilbur and Orville Wright flew the first engine-powered aircraft off the dunes of Kitty Hawk, North Carolina. To celebrate the centennial of this historic event, the Illuminations Festival of the North Carolina School of the Arts commissioned Wright Flight, a composition for orchestra and three narrators that revisits the events of that historic day. A member of the Kitty Hawk Lifesaving Station, John Daniels was an important figure in the drama of the first flight, and much of what he describes is factual, including his participation in the first flight photograph, as well as his unfortunate mishap at the conclusion of the fourth flight. Virtually all of the text spoken by the Wright Brothers comes directly from their letters and journals. 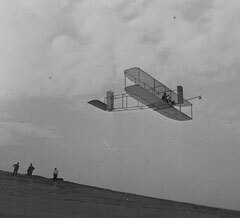 In addition to their prowess as scientists and aviators, Wilbur and Orville Wright were accomplished amateur photographers. A montage of shots selected from the hundreds of photographs they took of Kitty Hawk, its citizens, and their own tests and flights are projected onto an overhead screen as a seamlessly shifting backdrop for the performance. Wright Flight has had dozens of performances around the US, but none of them have been filmed. This movie file shows the first six minutes of projections, synchronized with the music and narration. The size of the projections for this presentation are, of course, dependant upon the venue in which is it is to be presented. However, it is suggested that the projection surface be a minimum of 9′ x 12′. The projection should be above and slightly behind the orchestra (keeping in mind sightlines from the audience in regards to the conductor). LCD projector – minimum 3500 lumens (brighter is better as the projections are from original photographs and some of the resolutions of the actual photo are poor). Distances of projector will vary with type of lens; however the distance should be adequate to fill the entire screen with the images. Apple computer (show was built on a Mac Powerbook). The more memory you have the better. With less memory and speed you may notice that transition of slides are not smooth). The show was built using I-Life Software (specifically, I-Movie and Keynote.) You only need Keynote to present the slides. The show file will be provided on a DVD disc and is approximately 500 mb in size. As Keynote is a licensed Apple program, we cannot provide this software. A cue description sheet and a production score will be provided with the show.